Matilda Bone by Karen Cushman. Review: Have you ever wondered what it's like to have an unexpected new beginning to your life? Well, Matilda Bone by Karen Cushman is the perfect book to tell the story of new beginnings for all readers in grades three or higher. Matilda is sent off by Father Leufredus to Blood and Bone Alley, home of leech, barber surgeon, and apothecary, where she is supposed to be assisting and be raised by Red Peg the Bonesetter. But she was taught Latin and French, and none of what she will ever do will involve any of it! Instead, she spends her time caring and assisting for Peg's patients, tending to the fires, going to the market where you can get scammed, and mixing up remedies to help the patients. She's basically living in a new world without she praying for some of the Christian Saints and learning what Father Leufredus teaches her. But even so, once she gets used to it, it's not so bad, and if not, she will always have them to pray to, right? Matilda Bone can be a page turner for anyone over the age of 8-9 or more because it teaches morals or life lessons. It can also be recommended for anyone that likes medieval times since it takes place during that time period. Cushman's writing brings this medieval period to life in her writing. The best part of the book for me was how hard life was for Matilda and how she tunneled through those hardships. 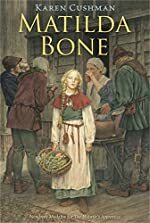 Overall, Matilda Bone is a great book, and I will positively read more Karen Cushman books! We would like to thank Houghton Mifflin Harcourt for providing a copy of Matilda Bone for this review. Have you read Matilda Bone? How would you rate it?